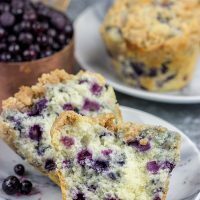 Blueberry Streusel Muffins - Make these bakery-style muffins for breakfast! 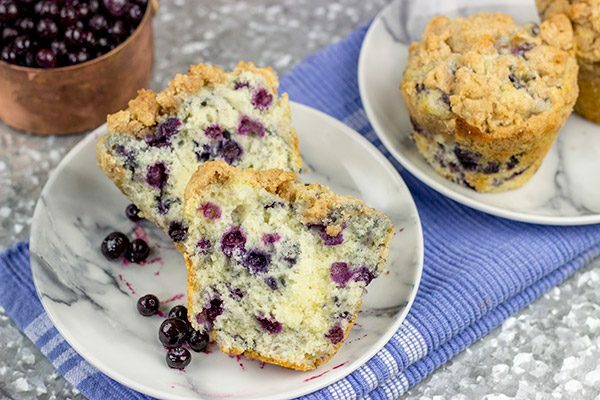 Blueberry Streusel Muffins are a classic weekend breakfast in our house. These muffins are filled with blueberries and topped with a cinnamon + sugar streusel…and they’re delicious! Saturday mornings are synonymous with Blueberry Streusel Muffins. As a kid, my Mom would bake a batch of blueberry streusel muffins at least twice a month. It always happened on Saturday mornings, and those were the best days ever! Waking up to the smell of muffins in the oven is one of the most comforting feelings of all time. Plus, as a kid, my greatest worry on Saturday was whether or not I could defeat Bowser on the latest Mario game. Blueberry Streusel Muffins and beating evil video game turtles. That pretty much summed up my Saturday plans. Last summer, we went up to a local blueberry and picked about 13 pounds of blueberries. Yes, 13 pounds. This has become somewhat of an annual tradition because (1) it gets us out of the house for an activity and (2) fresh blueberries. Also, I’m pretty sure we should’ve paid for 14 pounds because I think Robbie ate a pound of berries out in the fields. It would seem logical that I used some of our blueberry bounty to make these Blueberry Streusel Muffins, right? I did not. We ate every.single.one of those berries fresh. (When you pick berries fresh from the farm, they last for a long time in the fridge…thankfully!) Nope, I actually prefer baking with frozen wild blueberries. Wild blueberries are a bit smaller than the huge ones we found at the blueberry farm. So instead of having like 2 blueberries per muffin, I was able to squeeze a dozen or more berries into each of these muffins. 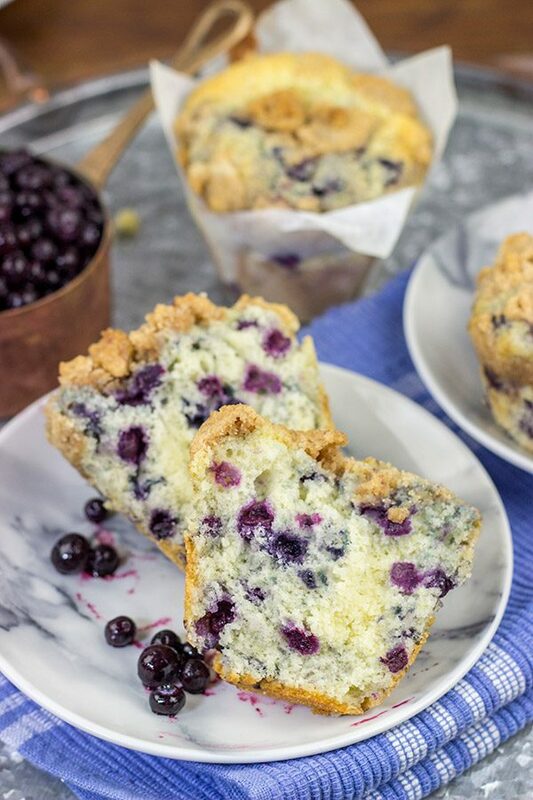 Blueberry streusel muffins are on my top 3 list of all-time favorite foods. I can’t walk past a blueberry muffin without eating it. Seriously. And that means I’ve eaten a lot of blueberry muffins over the years. Some very good. Some very bad. A lot somewhere in-between. But I’m not kidding one bit when I say that this Blueberry Streusel Muffin recipe is my all-time favorite muffin recipe. Growing up, my Mom typically just used a box mix, and that was all fine and good. But I like to bake from scratch, and I’ve been toying with this muffin recipe for years. By golly, I think I found it! The world’s best cup of coffee blueberry muffin. I recognize that’s a high bar to set, but this recipe is just darned good. I’ve made a lot of blueberry muffins over the years, and I’m not touching this recipe again. Ever. 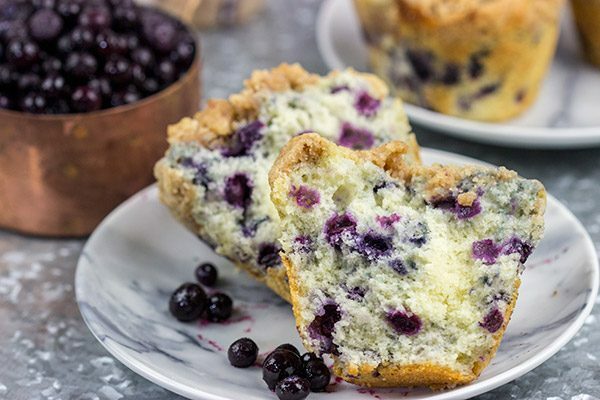 So let’s bake another batch of these Blueberry Streusel Muffins this weekend, ok? Then we can spend the rest of the day chasing a toddler or fighting evil Nintendo turtles. Enjoy, my friends! 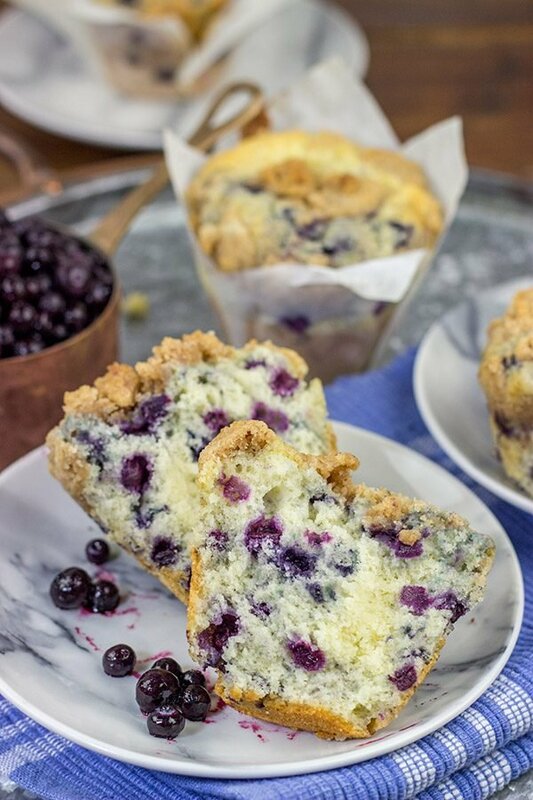 Did you make a batch of these Blueberry Streusel Muffins? Leave a comment! Or snap a photo and tag me on Instagram (@Spicedblog). Blueberry Streusel Muffins are a classic weekend breakfast in our house. These muffins are filled with blueberries and topped with a cinnamon + sugar streusel...and they're delicious! Using a medium bowl, add sugars and cinnamon; stir until well combined. Lightly spray a muffin tin with baking spray, or line muffin tin with paper liners. Using a medium mixing bowl, add flour and baking powder; stir until well combined. Set mixture aside. Using an electric mixer, cream together sugar, butter and salt until light and fluffy (~3-4 minutes on medium speed). Using a medium mixing bowl, whisk together eggs, buttermilk, vanilla and oil. Pour liquid mixture into bowl of mixer in 2 additions, mixing well after each addition. Add flour mixture and mix on low until well combined. Crumble the streusel mixture evenly on top of the muffins. Bake for 36-38 minutes, or until a toothpick inserted into center of a muffin comes out clean. I used larger tulip-style muffin liners, and I filled each liner up to the top of the pan. (Tulip-style liners stick up above the baking pan.) Regular liners are smaller, so I would recommend filling them only ~¾ full. This recipe will then yield more muffins (you’ll need 2 pans) and you’ll need to reduce the baking time. Lovely looking muffins you got there David. Robbie was very cute in that video. I think he’s a natural berry picker. My kids (who also played Nintendo)worked in the summer at a blueberry field picking berries. They got paid by the pound and could eat all they wanted. They would have purple fingers and lips for days after the picking season. I have a freezer full of wild lingonberries and next Saturday, I’m making your muffins with lingonberries. Haha! I can only imagine how much fun that would have been to be a blueberry picker as a kid. What a great job! All you can eat berries plus some spending money in the pocket…which no doubt went to Nintendo games, right? 🙂 Let me know how these muffins turn out with lingonberries. I’ve never had those! 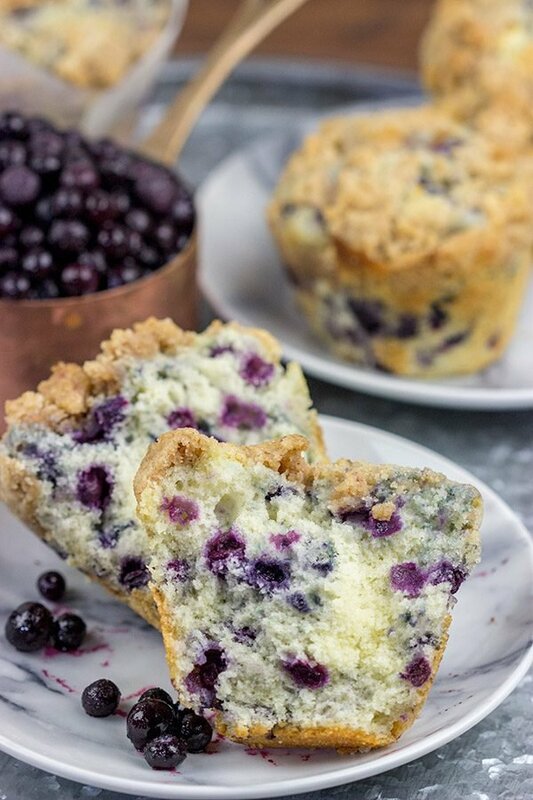 These blueberry muffins look wonderful! So light and fluffy on the inside and a little crispy on the edges. Just perfect. Robbie is so adorable picking (and eating!) blueberries! My kids are a little older, but when they were younger we went strawberry picking. I was so much fun but an incredible mess. The two year old had to go home sans strawberry covered clothing 🙂 Brings back lovely memories! My mom also made blueberry streusel muffins when I was a kid (my sister and I called them “muffins with the stuff on top” though). I haven’t had one in years! There’s something so comforting about blueberry muffins so I can see how you’d have a hard time passing one up. I’ll have to try this recipe because I’m sure my mom’s is lost to the ages. Have a great week, David! I’m totally going to start calling these Muffins with the Stuff on Top! 🙂 These muffins are seriously delicious, Kelsie. I’m seriously not tweaking this recipe ever again! Hope your week is going well so far! David – I think “streusel” is my middle name. Any recipe that has a streusel, I’m all in! And my son loves blueberries like nothing else, so I never have fresh ones around, either! And thanks for the tip about wild blueberries, I’ve seen the bags of them, but they were to small to do anything else with. Much appreciated! I’m right there with ya, Laura! Streusel could easily be my middle name, too. Heck, I could just eat a bowl of the streusel by itself! I say grab a bag of the wild berries and bake up a batch of these muffins. This recipe is seriously one of my all-time favorites! Hi David! My son thanks you in advance for these! I think I’ve told you that when we lived in MI we had a blueberry farm a half mile down the road from us. It was owned by brothers who were clients of Gary. One day one of the brothers (who was a State policeman) brought me a lug of blueberries that he had hand picked himself that morning!! Happy me! I do prefer to bake with Maine wild blueberries, they disburse so much better in batters. I also like to add a pinch of nutmeg when I’m baking with blueberries. You did indeed mention that you had blueberries nearby when you lived in MI. I’m jealous! Although to be fair, we do have some good berry farms around here (as evidenced by the video with Robbie from last summer…back when it was warm). Great tip on the pinch of nutmeg. I’ll have to do that next time. Hope your week is going well, Dorothy! I love blueberry muffins, too. Of course, I always make more than I need – so with the leftovers, I split them in half horizontally and fry the cut ends in butter. So good for breakfast! Oh man, you’re making me hungry, Jeff! I need to go make another batch of blueberry muffins STAT so that I can fry the cut ends in butter. I love that!! 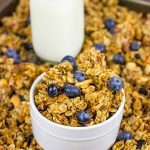 I love blueberry muffins and this streusel topping looks amazing! Our freezer is stocked full of berries picked last summer and making muffins is a perfect use for them! Time to get baking! Food is such an incredible thing, Valentina. Sure, it feeds us and keeps us going…but it’s such a social thing, too. Whether it’s sharing a meal with a friend or recreating memories through a recipe, food does it! Anywho, these muffins. Do me a favor and make a batch STAT. They’re so good!! Ha ha brilliant! When my brother and I were young my mum also took us berry picking in Scotland to keep us busy. We picked strawberries, raspberries, gooseberries and blueberries. And we also ate our weight in what we picked too. I do wish my mum had made us some of these delicious looking blueberry streusel muffins though. All of our berry picking was to make home made jam. Gooseberries, eh? I don’t think I’m familiar with those! I wonder if they grow here in the States. I need to find them! I have to say that homemade jam is a favorite, too, Neil. I haven’t made any in ages though, so I should make some this summer when fresh berries are back in season again! Hope you have a great weekend ahead, my friend! Awww!!! Robie is looking so cute in this video David. And the blueberry streusel muffins sounds yum!!! Thanks so much, Puja! Robbie was totally cheesing it up for the camera in this video. 🙂 I hope you have a great weekend ahead, my friend! I can see why these are the best blueberry muffins ever. 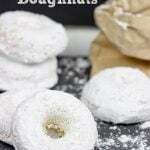 They look so delicious, I could have some right now for breakfast.